This weekend, I was doing a lot of yard work, even on sunday. I know, I know, it's supposed to be a day of rest. Oh, well. So, even though I'm working in the garden, I still wanted to cook. I wanted something simple and easy, a two-step, one-pot meal. I'd found, buried in the freezer, an old ham bone from one of my past dutch oven roasting days. 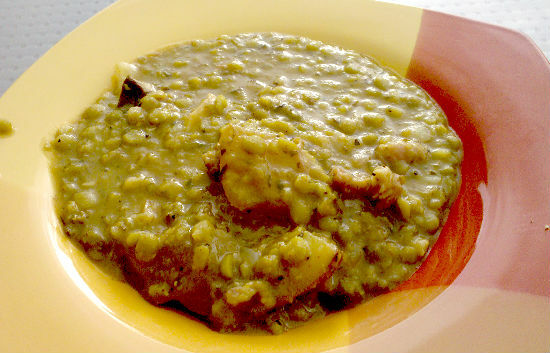 Time for split-pea soup! I had done split-peas many times before. This recipe for Dutch Oven Split-Pea soup is the first time, and this one has been the basis for all of them. It's good, but this time I kicked it up a notch. It must've worked, because even though I cooked up a whole 12" dutch oven worth of the stuff, there were no leftovers. That's good, too, because split-pea doesn't usually make great leftovers. It ends up as less of a soup and more of a paste. I've found, by the way, that when you do these recipes, your final result will vary a little based on the way you cooked your ham. Some of the residual flavors and spices from the ham will carry over into the soup. I, personally, like that. It gives a little variety. The same is true if you make your own chicken stock. Anyway, since I really dressed up this recipe, I'm going to rewrite it here, rather than just linking back. 1 ham bone with lots of meat left on it. I started by lighting up some coals and letting them start to get white. I put about a tbsp of olive oil in the bottom of my dutch oven, and let that heat up. I chopped up the veggies while it was all getting going. Once the oil was hot, I dropped in the onion, the garlic, and the celery to sautee. Remember, if it's hot enough, they'll sizzle as soon as you drop them in. I stirred them up and salted them a little. The dutch oven was plenty hot, and pretty soon they were browning. Then I added all of the other set two ingredients, and let it come back up to a boil. Once it was simmering, I started adding in the herbs and the chili powder. I added the chili powder a bit at a time. I'd shake in some, let it simmer for 15 minutes or so, then taste. Add some more, wait, and taste. I wanted it to have an edge, but I didn't want to have a recognizable chili taste. In the end, I probably added a little under a teaspoonful. Season with salt and pepper to taste, but be a little cautious, because the ham will add lots of salty flavor already. It turned out great! 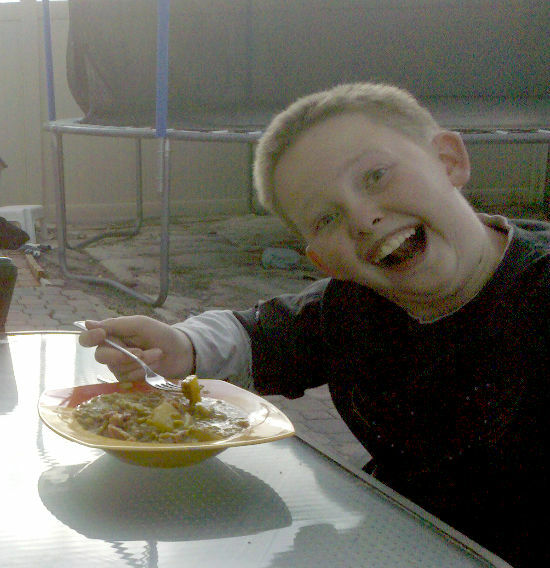 We all gathered around our new patio table, and had a wonderful outdoor meal. If you try this one, let me know how it goes!